I love to see deer grazing on my neighbor’s land across the pond from me. I see the deer pretty much every morning feeding there. My neighbors have such a nice setting too with their long sloping hill that has fruit trees scattered about and then down further there are six tall spruce trees planted next to each other around the water. From my side of the water it really is a lovely scene. Who wouldn’t like that right? Well my neighbor for one does not like it because deer eat the fruit right off of his trees. 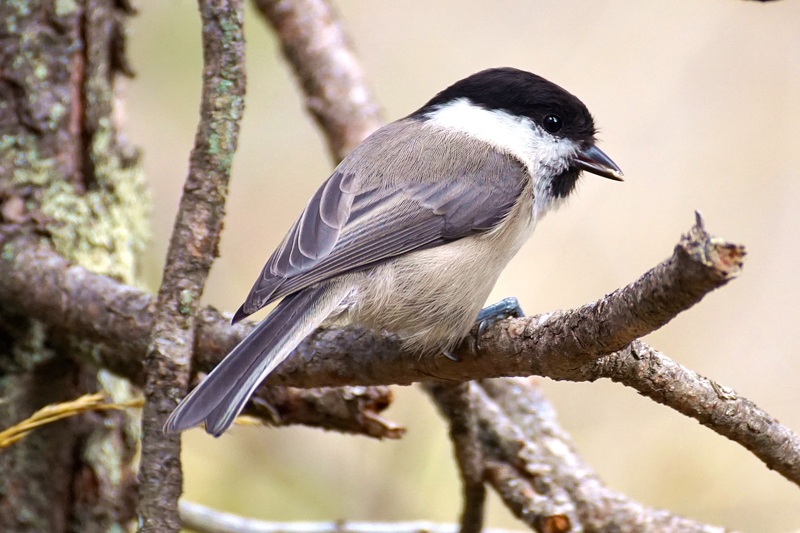 Other surrounding neighbors and I do not appreciate them because they like to snack on our ornamental trees and shrubs taking just the tops off of them or eating them completely to the ground. In fact, many people do not appreciate deer because they can wipe out their garden in a matter of hours. Just ask my sister. She has lost quite a few trees, flowers, and shrubs in the past because of these “overgrown rats” that has cost her a pretty penny. There are a number of things that you can do to prevent this from happening to your own garden that I have listed further down below. But first let’s take a look at what these rodents like to eat. 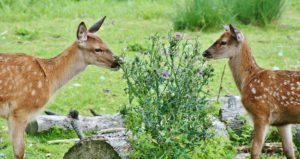 In order to figure out how to keep deer away from your garden it is important to know what they LIKE to eat. Yes, deer will eat anything if they are really hungry, especially at the end of the season when food is scarce. However, by eliminating their favorites, your chances are much higher to keep them at bay. The most desirable food for deer is nuts. They love acorns especially, but will also eat pecans, hickory nuts, and beechnuts. Deer also love fruit such as peaches, blackberries, apples, persimmon, and blueberries. They like many different types of grasses, twigs, leaves, bark, new shoots, buds, and blooms off of plants, flowers and trees, and also the buds, blooms, foliage, and thorny canes of rose bushes (especially Knock-out Roses). They also will devour hostas and arborvitae. This is just to name a few. As for trees deer like the dogwood tree, and wild crab apple. We can’t forget vegetables: beans, potatoes, sweet potatoes, soybeans, wheat, and rye. Deer will also eat out of your bird feeder if it is reachable. I have spotted one a few times at my platform feeder. As you can see deer will eat a variety of things, so if you happen to have a big population in your area (as my sister does) you might want to reconsider any of these flowers, plants, and/or trees. Or take the necessary steps to protect them as I will mention later. Added Note: You can’t always go by the label at the nursery either. Some labels may claim that the plant, flower, or tree is “deer resistant” or “deer repellent”. Don’t believe it. 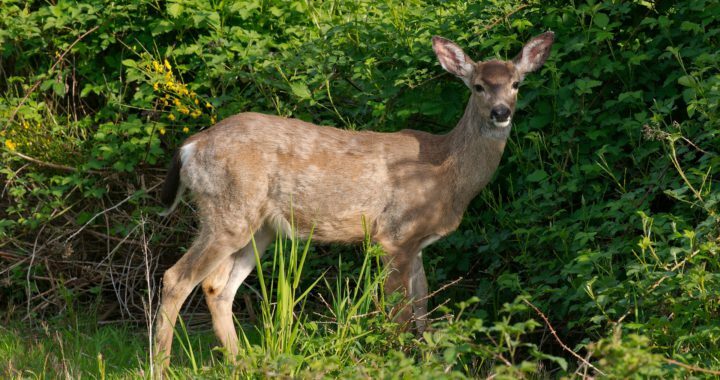 If food supplies are low, there is no tree, flower, or shrub that is completely deer proof. If deer are hungry they will eat anything they want. Just ask my sister! #1 Fencing – Put up a fence around your yard or land. My sister and her husband soon learned that when they put up a fence around their backyard they were able to keep the deer out. Yes, deer can still jump the fence but since my sister put hers up a few years ago she has had no problems with deer getting to her plants. #2 Individual Fencing – If you cannot afford to put up a fence around your yard, or it is just not ideal where you live, you can put fencing around the trees or shrubs that the deer are eating. My sister had to do this in her front yard around her dogwoods. No problems now. #3 Netting – is also a good option especially for smaller bushes and plants and around vegetable gardens. I have netting around one of my new shrubs in my front garden that deer decided to chew on one evening last fall. I thought I lost it but it has come back nicely and the netting it not that noticeable if you are worried about appearance. #4 Deer Repellents – There are different types of deer repellents that you can purchase such as Liquid Fence, Bobbex, and Deer Out, that have gotten decent reviews. The trick is you have to keep reapplying for it to work or else the deer will simply move right in on your plants. To be honest, my sister said this stuff is a joke because the deer really didn’t care, they ate her plants anyway. Keep in mind she has a huge population of deer where she lives. It may work if you only get the occasional deer coming through. 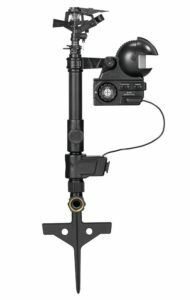 #5 Motion Activated Sprayers – there are motion sensors that you can purchase that activates a water sprinkler when deer are present. You can set it on a timer when you know deer will be feeding. I am not sold on this because if a deer is truly hungry it won’t care about the water. #6 Irish Spring Bar Soap – hang it with strings on trees and shrubs. The strong scent is supposed to keep deer away. While it is true that deer do not find strong aromatic scents desirable, I am not so sure that this method really works. Some people swear by this so it may be something to try. #7 Landscape your home with less desirable plants and trees – deer tend to ignore junipers, spruces, pines, and fir trees. They also do not care for black walnut trees, maple, sweet gum, mulberry, mimosa, and the paw paw tree. Deer also do like Butterfly Bushes, Spirea, Viburnum, Lilacs, or Bottlebrush Buckeye. They also avoid daffodils, foxglove, poppies, sages, ornamental salvias, and lavender. 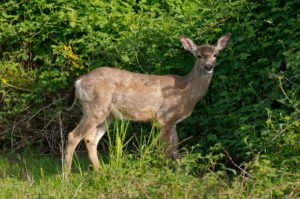 The above is not the entire list of plants, trees, and shrubs that deer will not eat. There are plenty more that you can choose for your landscaping that will work. Talk to your local gardener for advice in your particular area or ask your friends and/or family nearby to see what works for them in their gardens. When you spot a deer in the woods while hiking or out in a field grazing it is always a welcome sight. However, when they come and invade your garden eating up all of your plants it is not so pleasant. That is because deer eat fast and can wipe out your garden in just one evening. There are a number of methods that you can try that may keep deer away. This could be fencing around your yard (most effective), netting around bushes or vegetable gardens, deer repellents, hanging soap bars, and/or landscaping with plants and trees that deer like to avoid. It really depends on the deer population around you and what works best for your needs. If you have any further thoughts or experiences that you would like to share about this post, please feel free to make your comments below. Posted in Backyard Wildlife, In The Garden and tagged deer.